Combatting EMI effectively is a pretty big chapter in the electronics devision. "My thing does not work" HELP!!! Show us a picture of your setup. You might think the problem is simple, but in reality it can be fairly complex. Your circuit consists of invisible capacitors, transformers, inductors and antennas but you don't realise it. We have had a number of similar problems over the years here so you might want to search our previous discussions. You have inadequate clearance on your relay board. Your photo of your setup doesn't show us enough - you have some ps2 connectors - where do they go? Remember - current flows in a loop. All your wiring may be part of that loop. Is there a transformer in there as well? That photo was next to useless. Show your WHOLE setup. The quality of the answers is related to the quality of the information you provide. I don't see any decoupling caps across ALL of the microcontroller's power and ground pairs. Are they under the pcb perhaps? They need to be right at the IC's pins for best effect. Please show us the circuit diagram (not the pcb or its layout). The circuit diagram is also called the schematic in case you did not know. I still can’t see how the unit is powered. Make sure you have a clamp diode across your relay coil (especially if transistor is bipolar). Why have you not included a properly drawn schematic??!!? There’s diodes across the relay coils from what i can see. What worries me is the lack of electrical safety - clearance on the pcb tracks and thin wiring that is probably not fused adequately. 1. Wire size suitable for the voltage and current. 3. Adequate clearance between mains and extra low voltage circuits. Around 6mm on pcbs. Use a earth leakage breaker for your protection. I find it hard to give some supportive advise here. When I look at your photo's I see the result of someone who put quite some effort in (probably) one of his biggest projects ever. Changing what you did however into a reliable product would require a complete redesign. But with a bit of luck you might get it working good enough for your purpose. 1). Get some Ceramic Capacitors and solder them directly between the power pins on top of your uC. 2). Put series resistors on the uC pcb for all outgoing wires from the uC. If you have vor example a 4k7 base resistor in your relay circuit, then split that resistor in 1 and put 2k2 on the relay board and put 2k2 on the uC board. 3). Put series resistors on all uC inputs. At least 100 Ohm, but higher is better (For EMI) but if these get too big ( > 10k or so) you get other problems. 4). Separate all power wires from signal wires. The further apart the better. 5). Keep all power wires tightly together. Twist them and put ty-raps or tape around them. 6). Keep all signal wires tightly together. Twist them and put ty-raps or tape around them. 7). Put a real "common mode filter" in the power supply circuit, or at least an inductor. Almost anything > 10uH or so will probably help. 8). Put some split ferrite core's (see picture below) around your cabling. 9). Put a piece of sheet metal between the Relay board and the uC board. This piece of metal should be earthed / grounded. ( Can be made from ALuminimum soda can or steel preservatives can). If the list of suggestions I wrote above do not help enough, then I reccomend you do some background reading on EMI. Different kinds of it, how it gets into your circuit and how to combat it. Then start (almost) all over. Design a 2-sided PCB with a good ground plane, and possibly a power plane opposite your ground plane (high capacitive coupling). Put some EMI counter measures such as small ferrite cores and inductors on the PCB. You could use some opto couplers to keep the EMI away from the uC. Electrical wires soldered to a PCB have a tendency to break close to the PCB on the edge where the solder (suched into the wire) stops and bare copper begins. If you bend them flat to the PCB and glue them to the pcb the mechanical stability & reliability will improve. Have you looked at your reset circuit--what do you have there? Where is your schematic--do you want help? The relay transistors need to share gnd with the gnd at the micro, so the supplies can't be 100% separated. Alternatively, they could instead share V+, (depending on your circuit), but this is both rare and undesirable. If the gnds were 100% separated from any possible direct or parasitic connection, the logic signals would mean nothing when they arrived at the relay board. That would make them mad. this is schematic ,i didn't use resistor on mcu output as it will weaken the led current two. i used ceramic 100nf between 7&8 pin and 1uf electrolytic between 21&22 isn't this enough? Bypass caps need to be ceramic, not electrolytic. The ESR of an electrolytic is simply too high to meet the need. 100 nF on each pair of power pins. You still havent answered my questions. Do you want to solve your problem or run around in circles? Where does the 12V come from? Have you tried powering your circuit from a battery? Your circuit shows a number of push button switches, but i don’t see them on your pcb. off course, i want to solve my problem. Do you realise this is critical information? I gather the power supply is a switched mode (light) rather than an actual iron transformer(heavy)? If it is a switchedmode, the transients are coming down the mains, through your power supply and through your circuitry. Your pushbutton inputs are acting as antennas. So, devise some tests so you can determine where the problem is occurring - try a battery is #1, #2, remove your pushbutton and other wiring that is not needed. Write some code so you can operate the motor and determine if there is a difference. Also remove your lcd, as its wiring will act as an antenna. Strip it back to the minimum and work forward. If your tests determine the problem is the power supply, then look at how the current will flow across your 0V wiring. Make sure it doesn't flow across your pcb. 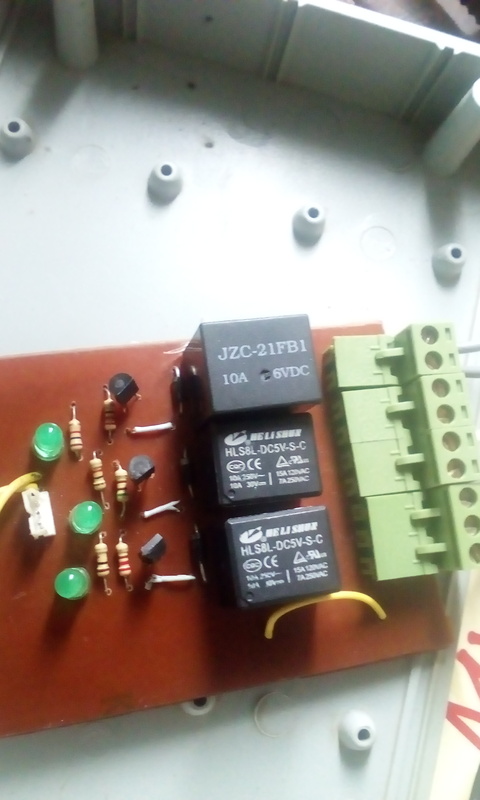 I notice in the relay board, the schematic shows three relays with the same part #, but one relay is different then the other two? In the picture of the relay board, one transistor it oriented different then the other two?? On your mpu board, you need 100nf caps on both sets of vcc/gnd pins, no the 1uf electrolytic will not work here. Your schematics look like someone spent a heavy night of drinking. Why the complete mess? Aside from that, how does gnd on the relay board connect to gnd on the micro board??? Also, how many times did you try changing hookup between dc motor, lamp and Ac motor...did the dc motor & lamp work each time? How big of an AC motor? A 100W bulb can have a pretty good 10x surge, so its a good fast transient load (compared to a motor revving up). Try adding 0.01 uF on your reset line--any glitch there & you are resetting & also set BOD fuse as well. I used Psu of computer , i think it's switchedmode, but in vain. they are connected with wires to separate them. what doesn't like you in the schematic? the dc motor and lamp are working good. the problem with ac motor ( small grill motor), by the way the problem is n't frequent may be every 10 switching. Inputs go on the left, outputs on the right...your valve driver schematic is all backwards...the control signals should arrive on the left, you relays should be on the right. Some connection look very jagged--why? Show where you proceor pins connect to, not some twisted scramblwe all over. The schematic does not represent your system. You need to formulate a test that will determine if there is a problem or there isnt. 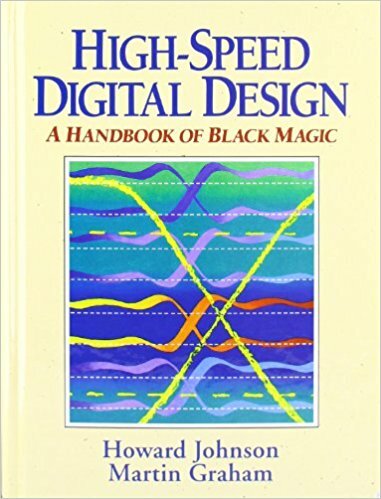 Otherwise you go around in circles relying on magic. Yes there is a problem when connecting ac motor, how to fix it? You havent given us enough information yet. I keep on telling you that the problem is more complex than you realise. Ok, ask me all questions you want and i will answer. I can't know what you are thinking. It resets and random number appears on lcd but not every time. Is there any thing not on its place on pcb or trace path is wrong. Do the jumbers that pass over the ground plane can cause this? ,i removed some jumber and connect resistors. A polyester cap is not good enough. It has a considerable self-induction since it is rolled layers. Use ceramic caps only for decoupling, both on VCC/GND and reset. Your power lines has large loops, and when relay opens the loops will emit electrical and magnetic noise. Twist the power wires in pairs to reduce noise, both power wires to the motor and the power supply.. Put an oscilloscope on VCC and reset of the uC to see what is going on. Noise on VCC can reset the uC. And then I could suggest to replace the relay with a triac, maybe an opto-triac. That ensures break only at zero crossing. That will reduce noise pretty much. I have 100nf ceramic i will use it. random number appears on lcd but not every time. An actual number or garbage? That tells a story. If garbage dots, ensure you wait 10 ms before writing to the lcd ...powerup can be slow. I have noise problem with switching small ac motor from mcu. 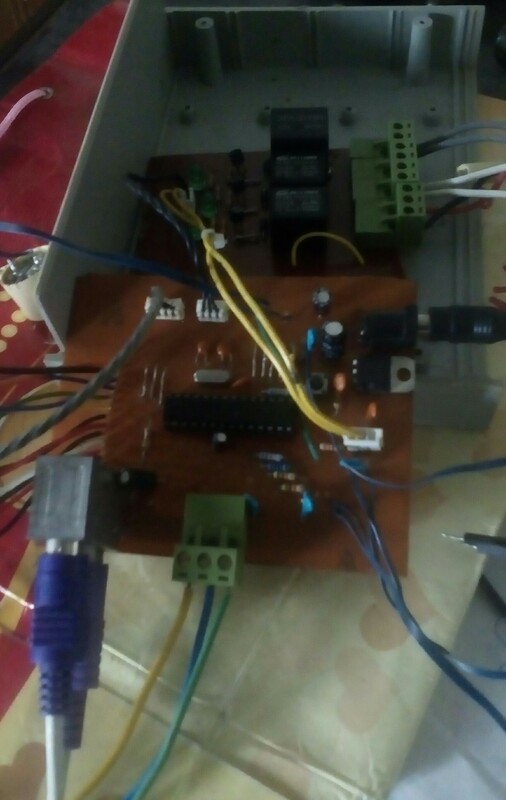 The circuit is working fine with ac lamp and dc motor. This means that the relay coil has nothing to do with it. Also, the fact of switching AC has nothing to do with it (since OK with AC lamp). In all likelihood, it has to do with switching relatively high currents when the relay closes or opens near the peak of the line voltage. This is a particularly difficult nut to crack. Usually, the first step is to immunize the electronic circuit with as much bypass cap as you can manage. Grounds may also be an issue, especially if there are long ground traces or wires rather than a good ground plane. Sometimes, common-mode chokes on the power input line do help. 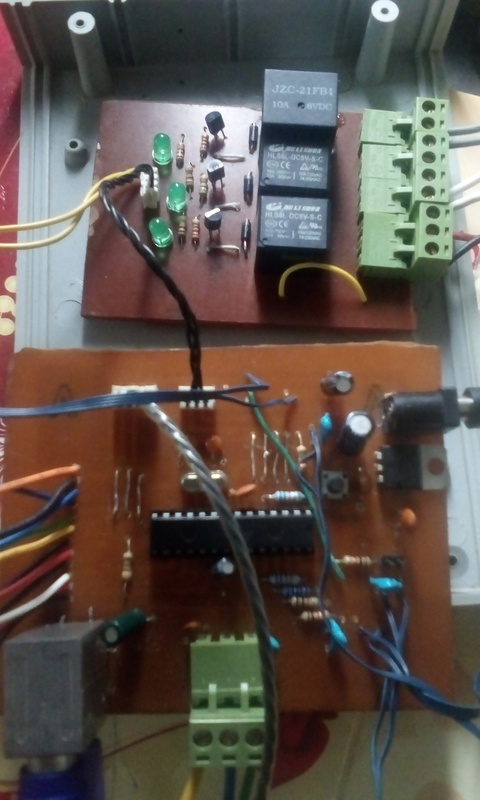 This is really where you need to put your effort because snubbers and such in the AC power circuit often result in unwanted power consumption. sometimes it display characters in place that isn't its place and sometimes garbage . it was working fine without relay. it was working fine without relay. Do you mean the relay or the load on the relay (motor)...your decryptions seem to vary. What makes you think there is some sort of reset going on? How would you see the reset?, just because the display might look scrambled does not mean the micro is resetting. You should put out a long pulse (like 1 second) on a pin with an led at every powerup/reset....then it is easy to tell if the processor is actually resetting. That is probably the first thing to determine. 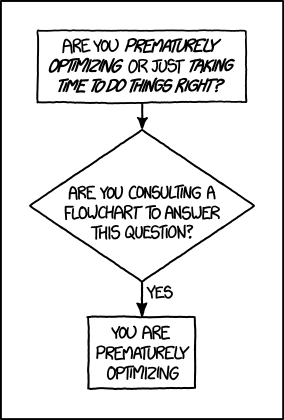 Beware that could also be a general software bug (such as a numeric conversion/string problem upon a large/small/offscale startup value). A cold lamp has a pretty high peak current surge (a motor may be lower for longer). A motor, of course, makes a nice magnetic field to couple into any wire loops. What does that mean? ...you are applying voltage to the relay coil with a piece of wire?... The diode must always remain connected across the coil even if you "pull a wire". Does the problem happen when the relay closes , opens or both? No picture of the display yet. You’ve still not given a conclusive result to the tests i proposed. The secret is understanding where the current is flowing. Until you give us the WHOLE picture, you’ll keep going around in circles. you’ll keep going around in circles. Looking at your PCB and guessing a little. PCB shown from top side, right? 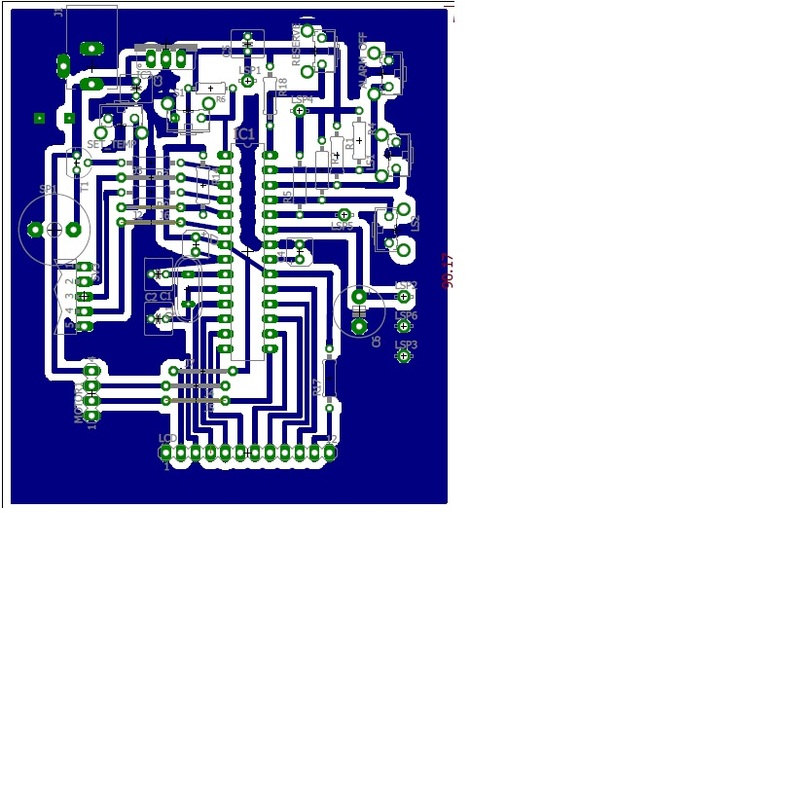 Then GND is pin 8 and pin 22 on Atmega328. But they are not connected directly! They should (must!) be connected with an as short as possible trace or wire. If I read the PCB correctly, pin 8 and 22 are connected through a power mosfet pin, which creates a wide open loop that can collect a lot of noise from the surroundings. Thats a possible reason for your problems. Solder in a short wire between the pins. If you have access to a scope, use it to search for voltage spikes on VCC, GND and reset pins. i can see reset because there is a clock on display and it start from zero when reset. I connect and remove the wire from output pin to check the reliability of the circuit even with fast action. but the normal operation is n't fast. but in normal operation when i let the program turn it on and off(without i interfere) the VCC is shown in picture D2, Vcc is almost constant. Setting your scope in auto mode will likely not catch the problem. Set the scope to single shot, trigger on negative edge and a voltage just below VCC. You are looking for a single event. Is that mean there is no noise on VCC? Also be aware that the scope may pick up the same transient so be aware that what you see may not be reflecting reality. For example, my scope picks up the washing machine in my house. The interference is most likely coming through your power supply. Still no picture of the lcd. 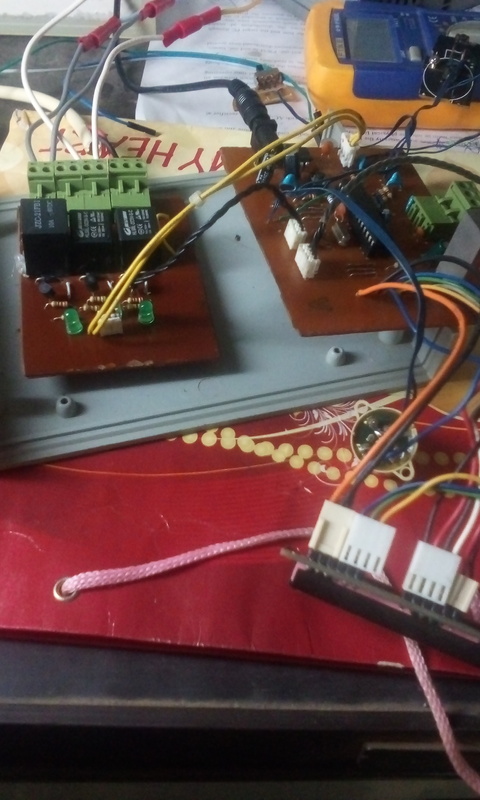 I had what seems to be an exact copy of your problem - a micro controller running some relays switch ac loads. The first problem was wiring. Separating the wires resolved that. Then the next problem was the mounting of the lcd. I had to mount it on a piece of plastic with adequate distance from the chassis. That took some time to figure out. Autoset on scope will likely not show transients. Autoset is good for repeated events, and useless for single events such as transients. You have to work a little with your scope. 1. Set scope to single shot / single triggering. Trigger to fire once on negative edge. Trigger on voltage just under VCC. Then the next problem was the mounting of the lcd. I had to mount it on a piece of plastic with adequate distance from the chassis. That took some time to figure out. Is that mean it is connected to pcb through wires? 1. Set scope to single shot / single triggering. Trigger to fire once on negative edge. Trigger on voltage just under VCC. I selected single then negative edge trigger mode, the probe is on VCC, Is that what you mean? Read the manual for your scope and have a play. sorry, i didn't get this how to do do it my oscilloscope is gw instek 1104b it's new. what do you mean by Trigger to fire once on negative edge. Trigger on voltage just under VCC? You got to learn how to use your scope. As far as I can see, its a DSO type. I have no experince with this specific model, I suppose you have a manual? Your scope most likely have a trigger menu or other ways to select triggering. Set trigger to single event, negative edge. If you have VCC=5V, set voltage level to 4V. If 3.3V set it to about 2.5V. Wait for an event that fires the trigger. Se on the screen what you got. I am serious about the wires. Open loops generates and collects noise. Twisting wires in pairs reduces both. Try it! I did that and there was spike when relay turn off but i am not sure if voltage level was 4v . The only wires now are for output signals and lcd i can't put it on the board. How does open loop look ,give example please to compare it with my case. I did that and there was spike when relay turn off but i am not sure if voltage level was 4v . 4V is just a suggested trigger level. A voltage drop of a volt or more got to make trouble. 1. set trigger as described to single event, falling edge, probe on VCC or reset as close to IC1 as possible. Your users guide may use other words, but it should be described in trigger menu. 2. your scope will now display a totally blank screen. 3. kip the relay, and bang, the scope will display the glitch. Scope screen will not refresh! Remember: a DSO scope can show not only what happens after triggering, but also what happened before it. 4. once captured, the scope can measure how deep the voltage drop is, and how long it lasts. You cannot outpace a diode with a relay, no matter how slow the diode is! 1N4148 is a small signal diode, not suited for the purpose. It might blow. You want a diode that can take some beating. You already know how it looks from your own pictures. Any 2 wires carrying the same current, and having a distance between is an open loop, asking for trouble. 1. power for the motor. When the relay opens to stop the motor, current is likely still running through motor, wires and relay contacts. The motor is an inductive load, which means that energy is stored in its magnetic field. When relay breaks, this energy will create a spark over the relay contacts. That again turns your motor wires into antennas, emitting electromagnetic noise. This is a primary candidate for your problems. Twisting the motor wires together and keeping them as short as possible reduces the problem. A triac that breaks only at zero crossing could be much better than a relay. 2. same goes for relay coil, but to a lesser degree. 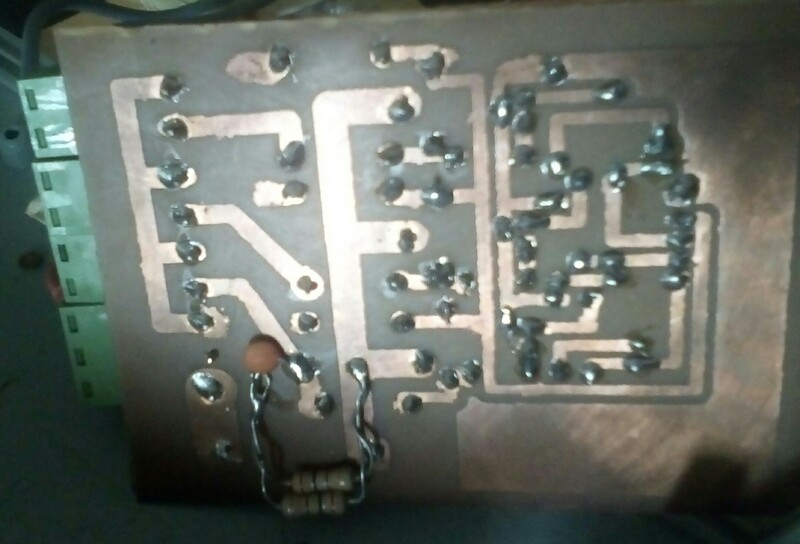 3. your PCB have a ground plane horseshoe shaped with a giant hole in the middle! Even worse, the 2 GND pins of Atmega328 are connected to each leg of the horseshoe, but not directly to each other. Your ground plane is an antenna! That could easily pull the carpet under the atmega. how to improve ground plane ?should i split it? should i connect the two gnd pins of the atmega8 to each other? I twisted the motor wires together, i replaced 1n4007 with 1n4148 , i noticed improvement and it's working since yesterday. it is working with no resets or random characters on lcd. i set up scope as you mentioned there are spikes sometimes there aren't when relay off on vcc and reset pins but its magnitude is less than with 1n4007. YES! Exactly! Connect the 2 GND pins of Atmega directly, but don't split the ground plane. I twisted the motor wires together, i replaced 1n4007 with 1n4148 , i noticed improvement and it's working since yesterday. it is working with no resets or random characters on lcd. i set up scope as you mentioned there are spikes sometimes there aren't when relay off on vcc and reset pins but its magnitude is less than with 1n4007. 1N4148 may have a short life in this application. High current or voltage spikes can kill it. If you think a fast diode is better, then chose a fast rectifier in the 1Amps range, or a diode made for noise suppression. I think you could benefit from reading up on electrodynamics. Try to understand that wires acts as antennas. Wires both emits and receives noise. Proper arrangement of wires greatly reduces noise. How to eliminate spikes then? I real world you cannot eliminate spikes and noise. You can reduce noise. You can reduce the effect of noise in your circuit. Understanding electrodynamics is essential. Read up on it! This leads to a very tedious guiding of OP to partial solutions and is why this is now post #61. I find reading / following / posting in threads like this a waste of my time, and am not inclined to participate further. The reverse-voltage supression diode in this application only needs to handle the current that the relay draws when it is energized. Remember, an inductor (the relay coil) simply attempts to maintain a constant current through it. If a relay coil draws 20ma when energized, when it is de-energized that same 20ma is imposed across the diode, and only for a very short time at that. 1N4148s are extremely fast diodes and will work fine, assuming the diode voltage rating is also considered. To blather on a little more, when an inductor de-energizes, the voltage rises as high as it needs to until the current through the coil reaches what it was previously. If the suppression diode is "slow" like a 1N400x, the reverse voltage in theory, can rise much higher than the diode's rated forward conduction voltage because of the time needed for the diode to go into conduction. I think that the problem is solved because of twisting the motor cable and arrange cables.